When talking to people it’s suggested you approach them at their level, which means shorter women teeter on heels and men crouch down awkwardly for a heartfelt one to one. Eye contact is constantly recommended as a way to assert yourself and bond with people, and artist Hans Hemmert seems to have taken this option and run with it.. into the realms of surreal territory! Welcome to Same Height Parties where guests pick footwear based on their height, and everyone stands at an even 2 metres. This is a quirky way of addressing the notion of how first impressions are made, as any height related impressions are now read from the floor, rather than their head. Apart from the fact that venue spaces are going to need high ceilings and tables require stilts (so drinks can be reached), this idea has a lot of promise, and minimal props are needed to effect it. 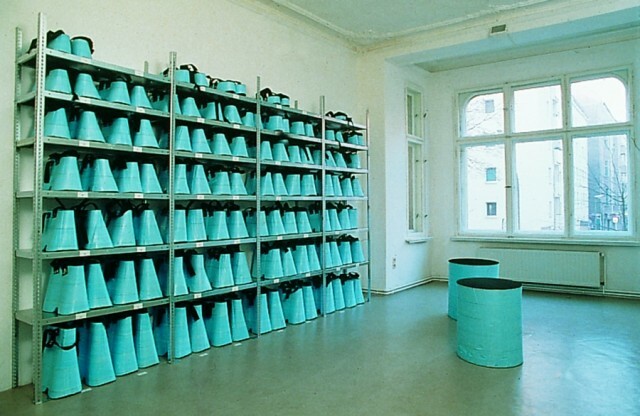 Hans Hemmert entitled this physical articulation of party social skills ‘Personal Absurdities Level’, and though these images may have been making the Meme rounds (where I picked it up) it’s actually from a 1997 project he showcased in a Berlin gallery. Despite these images being over a decade old, the concept and execution feels every bit as relevant today as it did then, as people still interact on different planes (physically, mentally, metaphorically) and it’s pretty cool to see a room with these divides vanquished. 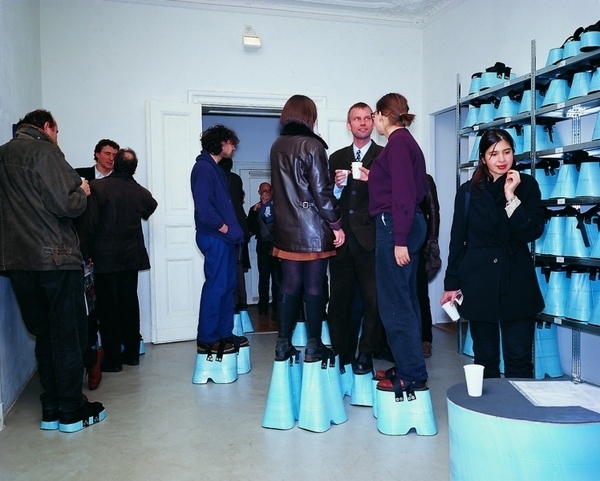 I know this was a pilot project, but I’m thinking that London would be a great place to hold Same Height parties, as I feel people would really gain something from it- and that it would be pretty entertaining walking around on shoe extenders! Would you care for a Same Height Party in your town? These are crazy! I think I’d go to a party like this.. maybe. I think this is an awesome idea! I am only 4ft. 8in., so being at a party where I am the same height as everyone there would be mind boggling! I would definitely have/go to one of these parties! Just when you think the pic idiocy has reached maximum height, you’re proven wrong. I would love to go to a same height party, I’m 197cm it would be good to look people in the eye. Perhaps though I might find everyone really intimidating!